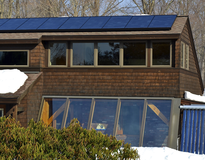 South facing glazing and a mass wall supplies half of our passive solar homes space heating needs. 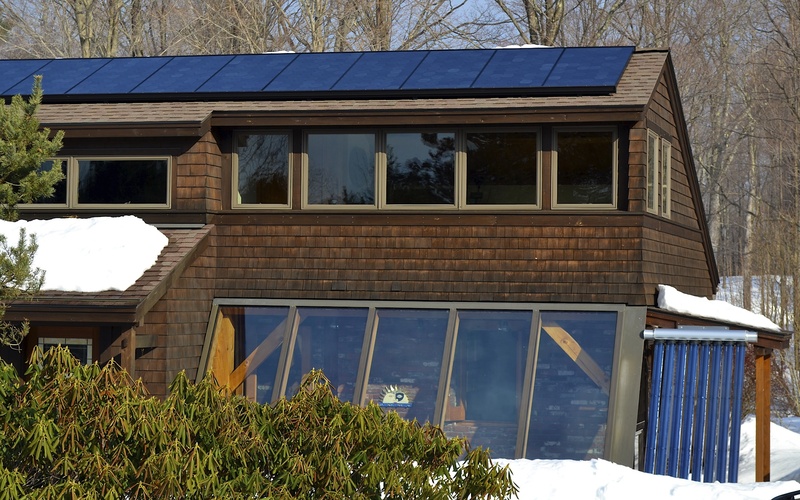 PASSIVE SOLAR WITH THERMAL MASS WALL AND FLOOR 130 sq. 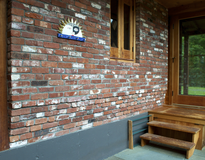 ft. sunspace with blue stone floor; 150 sq. ft. of sloped double glazed insulated glass on the sunspace, at a 60 degree angle. 100 sq. ft. of vertical double glazed insulated glass facing south. 130 sq.ft. 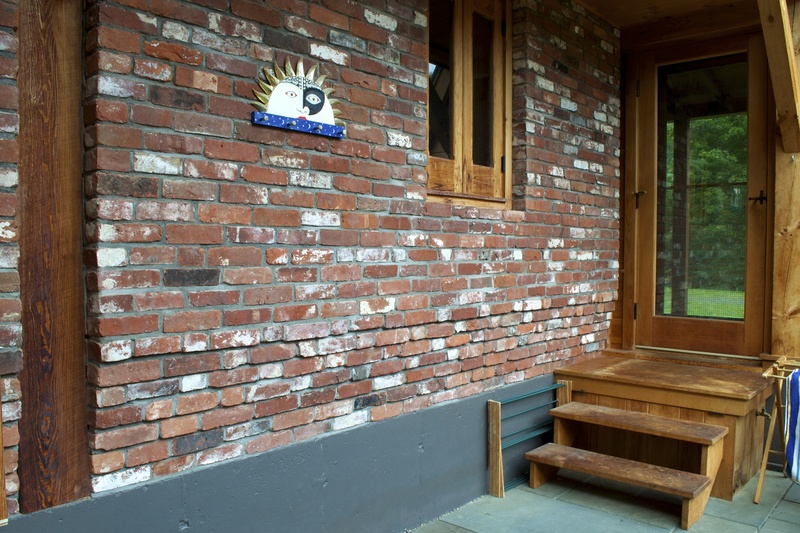 x 12" thick brick/concrete mass wall at rear of sunspace. The wall is heated by the sun in winter, and is shaded in the summer due to the higher solar angle. 1000 sq.ft x 6" thick concrete slab with tile floor on first floor of house. 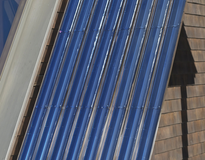 A thermostatically controlled fan moves heated air from the ‘solar hot air furnace’ (a.k.a. sunspace) into the living space on sunny days. The sunspace also doubles as a solar clothes dryer and a greenhouse for starting vegetable transplants in the spring. But my favorite use of the sunspace comes when we hang up our hammock on a cold winter day. On a sunny 0℉ day, our 'solar furnace' will be 80℉ or more! Life is Good. 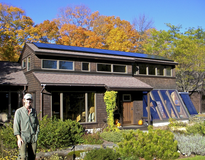 GREEN BUILDINGS OPEN HOUSE Saturday Oct. 13 - 10 am to 4 pm Michael and Kathy Nerrie 507 March Hill Road Walpole, NH 03608 DRIVING DIRECTIONS from Walpole and from Keene: From the post office in downtown Walpole, go south on Main Street a few hundred feet. Turn left onto Prospect Hill Road. Go 0.75 mile up long hill. Just past the golf course, take slight left onto Maple Grove Road. Go 0.75 mile. Stay left of Toles Automotive then bear right onto March Hill Road. Go 2.25 miles. Driveway is on left just past a large run-down arched roof barn on right. From bandstand in Central Square in Keene, take Court Street north 2.5 miles to traffic light. There is a 7/11 convenience store on right just before intersection. Turn right onto Route 12A North. Go 8 miles. Turn left onto Walpole Valley Road. Go 2 miles. Turn left onto March Hill Road. Go 0.25 mile. Driveway is on right.